Last time they were made out of thin 9mm birch plywood. This time 19mm MDF with double bottoms and tops. And painted black as the speakers are. I might fill the tube with a bit of sand to create ballast. They are also 50cm tall instead of 65cm as the old were. WAY too tall. The speakers weigh about 32kg if I remember correctly. And with all that weight that high it can be a bit tippy. The old center speaker sound great, really great. 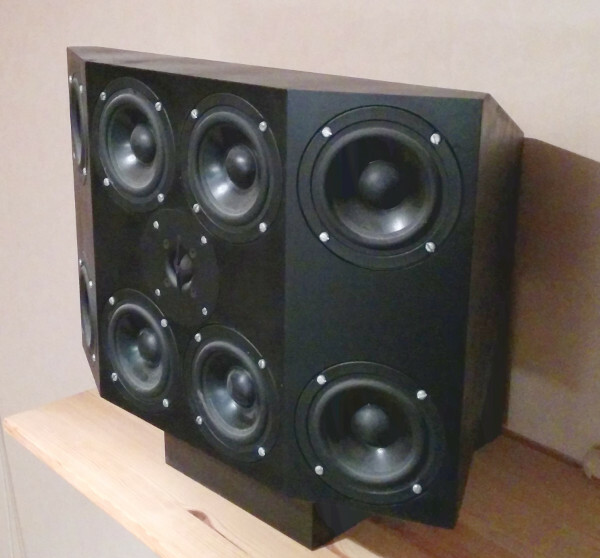 It is a very unique design by Björn Östberg where each woofer has its own enclosure that is cone shaped. Inspired by B&W Nautilus. 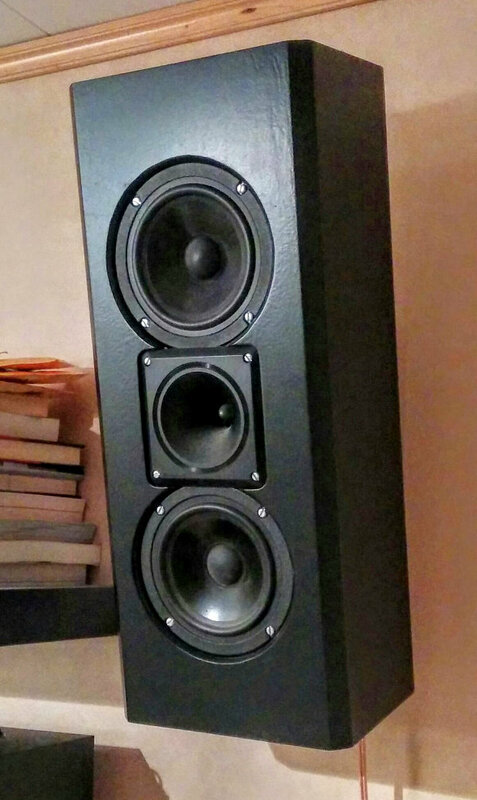 The four outer speakers have a lower cutoff frequency than the center ones. But it is very large and overkill (not to mention heavy). 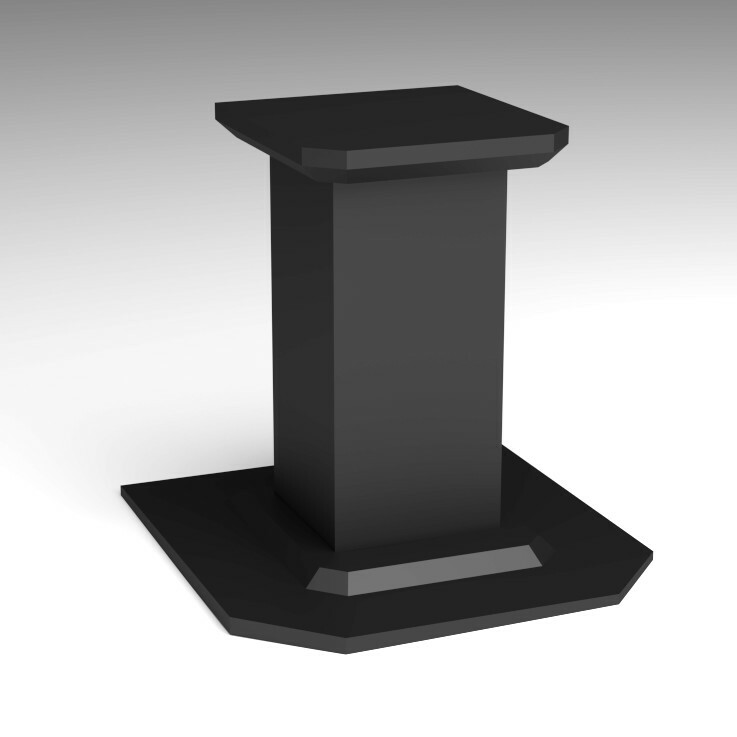 It has a large sound image due to the 8x 4″ speakers and the direction of the side speakers. But the audio coming out of the center channel does not require such massive speaker. So to make a speaker that better fit a flat screen TV I will make a new enclosure out of 19mm MDF and mount the tweeter and two woofers. I have yet to decide if I will rework the filters or get a new one. Box volume approx 3.5l. I have bought some ash that I will laminate the baffle with to thicken up and dampen it. Maybe a bit overkill but I don’t want it to sound boxy. And voices tend to, in my experience, vibrate at around the resonance frequency of the wood. So even though 19mm MDF is quite dead, two different kind of materials cancel eachother out. The current four surround speakers also do sound great. I used two of them as front channels until the large fronts were finished. They have two 5.5″ speakers and a Motorola “Superhorn” tweeter. Great clarity but not as flat as the fronts. They are however also too big and I am making a new enclosure with just one 5.5″ woofer and the tweeter. Also in 19mm MDF. The current ones use 12mm I think. These will be around 3l in volume and does not require a filter as this tweeter does not need any. Also the surround channels does not receive much sound anyways. This has motivated a slight undersize of the enclosure as the lower frequencies is never there. This is also why the baffle will not get extra wood to stiffen it up. The 19mm MDF is stiff enough for a surround speaker. 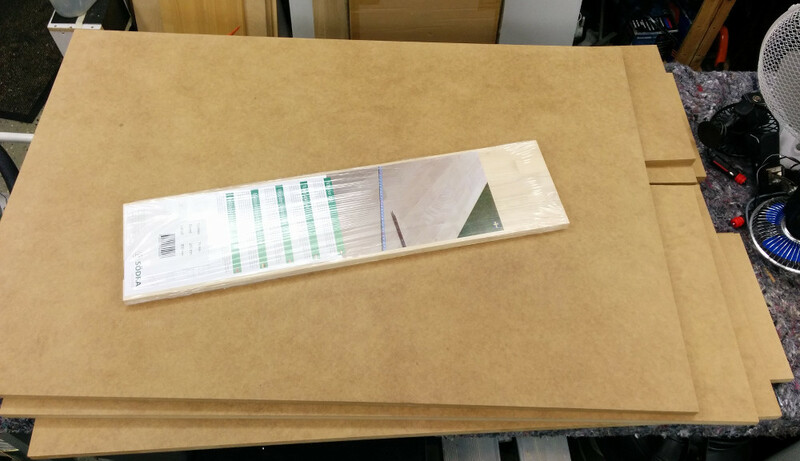 I visited the home center and got a small pile of pre-cut MDF. I can’t take full sheets (2440×1220) and it’s more convenient to have it pre-cut. K-Rauta sells pre cut pieces of varying sizes. I got a bunch of those 295x1220x19. The speaker stands require a bit wider boards so I had them cut up a full sheet for me too. And here is the pile of MDF (and ash) I got at the home center.